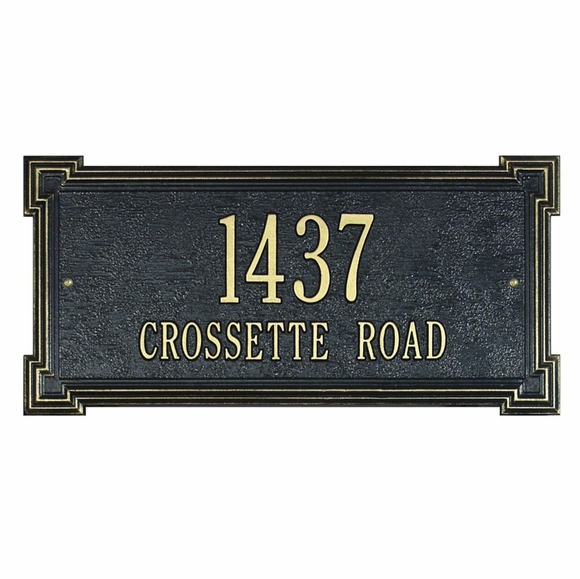 Metal Address Sign - - 17.5" x 8.5" rectangle address plaque with one or two lines of personalization. Wall mount. Made in USA. A one line sign holds up to five (5) 4.5" numbers. A two line sign holds up to five (5) 3" characters on line 1and and up to seventeen (17) 1.25" characters on line 2. If you are ordering a one line sign, please leave the Line 2 input box empty. Color combinations: BG black plaque with gold characters; GG dark green plaque with gold characters; OG bronze with gold characters; AC antique copper; PS pewter with silver characters. Dimensions: 17.5"W x 8.5"H x 1/4". Metal Address Sign with one or two lines of personalization. Wall mount. Custom made with your personalized text and color selection. Made in USA.